As we delve deeper into the ‘Digital Age’, we witness an explosive growth in the volume, velocity, and variety of the data available on the Internet. For example, in 2012 about 2.5 quintillion bytes of data was created on a daily basis that originated from myriad of sources and applications including mobile devices, sensors, individual archives, social networks, Internet of Things, enterprises, cameras, software logs, etc. 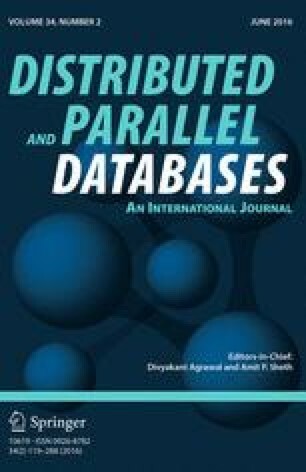 Such ‘Data Explosions’ has led to one of the most challenging research issues of the current Information and Communication Technology era: how to optimally manage (e.g., store, replicated, filter, and the like) such large amount of data and identify new ways to analyze large amounts of data for unlocking information. It is clear that such large data streams cannot be managed by setting up on-premises enterprise database systems as it leads to a large up-front cost in buying and administering the hardware and software systems. Therefore, next generation data management systems must be deployed on cloud. The cloud computing paradigm provides scalable and elastic resources, such as data and services accessible over the Internet Every Cloud Service Provider must assure that data is efficiently processed and distributed in a way that does not compromise end-users’ Quality of Service (QoS) in terms of data availability, data search delay, data analysis delay, and the like. In the aforementioned perspective, data replication is used in the cloud for improving the performance (e.g., read and write delay) of applications that access data. Through replication a data intensive application or system can achieve high availability, better fault tolerance, and data recovery. In this paper, we survey data management and replication approaches (from 2007 to 2011) that are developed by both industrial and research communities. The focus of the survey is to discuss and characterize the existing approaches of data replication and management that tackle the resource usage and QoS provisioning with different levels of efficiencies. Moreover, the breakdown of both influential expressions (data replication and management) to provide different QoS attributes is deliberated. Furthermore, the performance advantages and disadvantages of data replication and management approaches in the cloud computing environments are analyzed. Open issues and future challenges related to data consistency, scalability, load balancing, processing and placement are also reported. The authors are thankful to Kashif Bilal and Osman Khalid for the valuable reviews, suggestions, and comments.